The Southside Master Gardener Association (SSMGA) supports the Virginia Cooperative Extension and its mission to “enable people to improve their lives through an educational process that uses scientific knowledge focused on issues and needs”. A funny thing happened when I moved down here, I learned that a buttercup isn’t that weed that you stick under someone’s chin to see if they like butter, but a daffodil. I first heard the term when my dear friend Nancy’s neighbor called her to tell her that the field by their house looked so beautiful because of all the buttercups blooming. We agreed she must have been talking about daffodils. So what is correct? Doesn’t matter because common plant names are just that, what something is commonly called in a particular area. That is why it is important to have a basic understanding of botanical names. 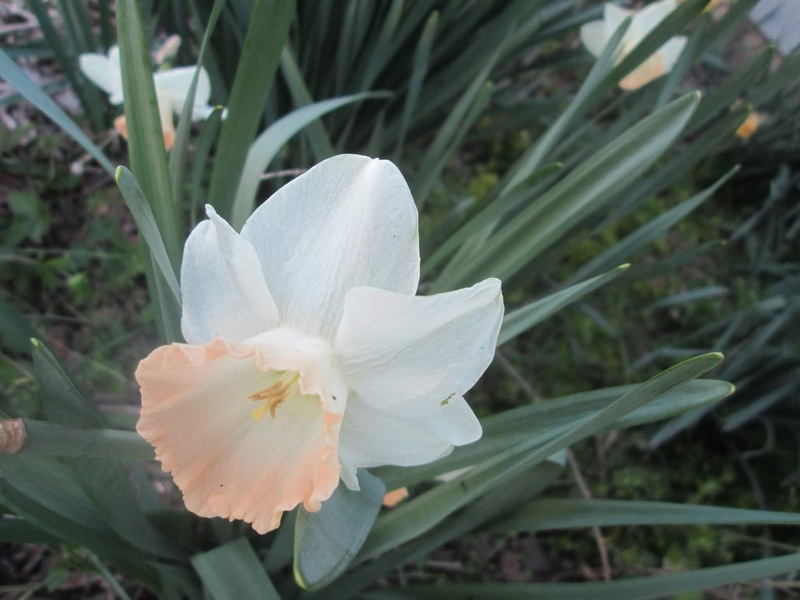 This Narcissus pseudonarcissus ‘Pink Ribbon’ is known in Southside as a buttercup but generally called a daffodil in other areas. According to use – edible, medicinal, spice/herb, ornamental, timber. We all know that Lavender would fall into at least 4 of these categories so that wouldn’t work. Descriptive system that would describe the plant so a carnation would be known scientifically as Dianthus floribus solitaries squamis calycinis subovatis bervissimus corollas crenatis – this was definitely too unwieldy. Back in 18th century, Carl Linneaus developed a binomial nomenclature that is easily understood and is meaningful. This system has become the internationally accepted method of naming plants and the animal kingdom also. If you visit a garden in Japan, the botanical or scientific name of a particular plant would be the same as if you visited Lewis Ginter Garden in Richmond. The accepted taxonomic units drill down starting with the Kingdom which is Plantae, then division, class, order, family, genus, species, variety or subspecies and cultivar. To the gardener, the family, genus and species are the most important. The family is a group of plants grouped together because of appearance but more importantly, because of inherent characteristics like reproductive structures of the flower, fruit and seed. Look at the Lamiaceae or the mint family, there are 5 things that they usually have: square stems on juvenile stems, opposite leaves, aromatic foliage, blooms in raceme (flowers up a stalk) and whorled and bivalvate – 2 lipped flowers. This is meaningful so next time you look at a mint or bee balm, check these characteristics out. The second level that matters to us is the Genus or generic name. This is the first part of the 2 pieces of a plant species name. These plants have a closer relation within the family and similarity of flowers and fruits is the most important link but also things such as roots, stems, buds and leaves. Example is Prunus, this is the genus that includes cherries, plums, skip laurels, apricots and peaches. A clue that you have a plant in this genus are the 2 glands at the base of the leaf. All Prunus also have beautiful lenticels. The third name is the specific epithet and it generally will have some clue about the plant. For example Rosa glauca. Glauca means blue and the blue tint on the leaves is very apparent. The combination of the genus and the specific epithet is the species so Rosa glauca is the species. It goes a little bit further for example Picea pungens ‘Glauca’ is Colorado Blue Spruce. The pungens refers to the pungent taste and if you ever chewed a needle it will taste very good but pungent and the cultivar Glauca means blue. The Jerusalem Artichoke as a great example of a why common names don’t mean squat. Indeed, it is not from Jerusalem and isn’t an artichoke. However the botanical name Helianthus tuberosum will give you a clue. Helianthus meaning that it is a sunflower and tuberosum meaning that it has tubers which are what we harvest and eat. Knowing the botanical name will ensure that you get the plant you really want. If you google the botanical name you will get more reliable sites. Sites with domains of .gov or .edu are the best ones to use because these have scientifically researched information. Use your common sense with a .org. Ones like the American Rose Society or the American Hemerocallis Society would be a reliable resource for those plants. .coms are generally someone’s opinion and that opinion may or may not be accurate. You certainly don’t have to call plants by their botanical names in normal conversation but to research a plant the botanical name is best. Anytime we want to add a plant to our landscapes it is important to learn where that plant wants to be – the right plant in the right place. Happy plants are healthy plants and that is what we want in our gardens.